Did you know that if you’re sick, you should reschedule your tattoo appointment? Aside from possibly passing your illness along to the artist giving you the tat, you put your own body at greater risk of getting an infection because your immune system is compromised. When you get a tattoo, you puncture your skin and create a wound. Don’t make your body do double-time healing against your illness and your skin abrasion. Also, if you’re taking pain medication for an illness or injury, be careful. Medications like aspirin and ibuprofen are blood thinners and affect your blood’s ability to clot. After a tattoo, you want to bleed less not more! Do not let a friend do the job unless she/he is a licensed professional. Piercing your ear may look easy but you could wind up with uneven holes, a torn earlobe, an allergic reaction, or an infection. Make sure whoever is in charge of the piercing is licensed and that s/he works for a reputable shop. The place needs to be clean and professional. Check out reviews and ask people who’ve been there. Consider where you want the piercing and how it will look before you actually have it done. Are you trying to attract or detract attention from one part of your body? Will the piercing do the trick? Also, make sure you have some products at home to care for the piercing such as anti-microbial soap and non-iodized sea salt. And don’t remove the earring before advised or you run the risk of the hole closing or the possibility of infection. Make sure the place you go staffs only people who are well-trained, professional and licensed. The shop must also be licensed through the state and authorized to perform tattoos. Always make sure the needles and tubes are removed from sealed packages and that the artist uses medical grade disinfectant on any non-disposable equipment between customers. Check out the environment -is it clean? What about the crowd -are there lots of people there and do they seem like they are happy with the service? Do your homework about the shop and the artists, including checking out references, before you get your new tat. Carefully consider the design before you commit. Whether you create your tattoo design yourself or just bring an idea to the artist, it’s important to communicate well and have them draw up a mock tattoo. Once the draft is completed you can tweak it before placing the tattoo stencil on your skin. A tattoo is a lifelong decision, so you want to make sure it is done right. How long your tattoo takes to heal may depend on where it’s located on your body. Immediately after you have it done, keep your eye out for: redness, swelling, muscle aches, fever, diarrhea, and severe pain; they could be a sign of infection. If you think your tattoo or piercing might be infected or you’re concerned that it is not healing properly, contact a healthcare provider immediately. Keep your tattoo area clean and unless otherwise instructed, remove any bandaging within 24 hours. You should apply an antibiotic ointment on the tattoo until a scab is formed. Keep the skin clean and use a very mild unscented soap followed by a moisturizer. Make sure to avoid sun exposure for at least three weeks. If you want great body art, you need to start on the right canvas: healthy skin! 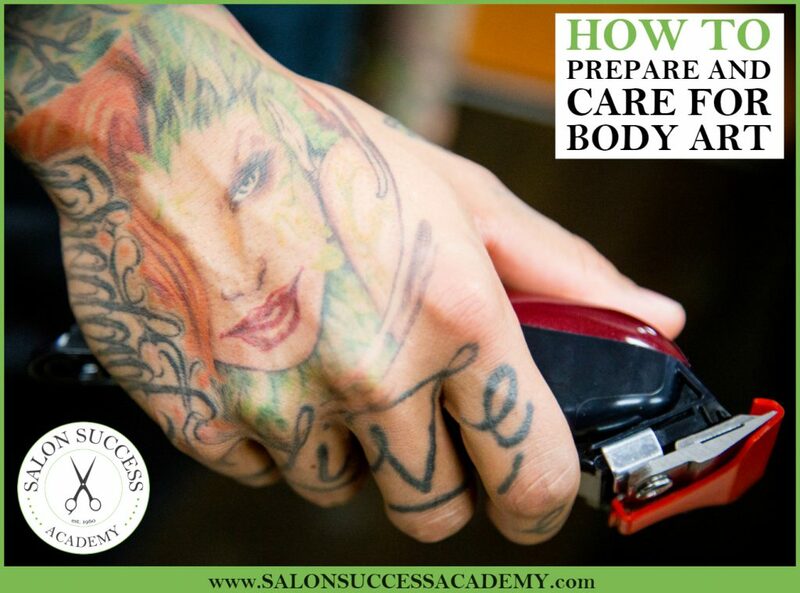 Find out all about skincare and the career of an Esthetician at Salon Success Academy. We offer our Esthetician program at our Corona, Redlands, Upland, and West Covina campuses. Fill out the form to learn more now.